Inspired by Jamie O'Neill's award-winning novel, At Swim Two Boys is a story of the developing love between two teenage boys set against the backdrop of the 1916 Easter Up Rising in Ireland. 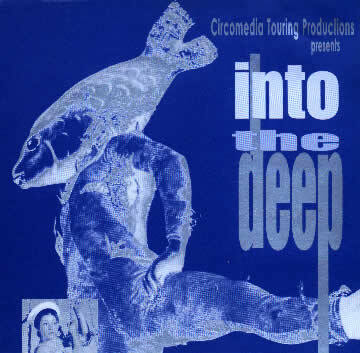 It is a tender and visually engaging production performed in a set that gradually fills with water. It featured a sound score written by Roger Mills and performed live with Frank Naughton. The choreography was directed by Jessica Cohen, Jim Ennis with dancer's Cai Thomas and Terry Michaels. Coinciding with the 10th anniversary of the book publication of At Swim Two Boys, Earthfall restaged this award-winning production which toured the UK and Wales in the Autumn of 2011 and Spring 2012. Selected compositions from the score were also featured in the Third International Sound Score and Music Composition Exhibition, Prague 2011, and the Gormley to Gaga UK Performance Design Exhibition, V&A museum London from March - September 2012. Earthfall Dance company's third collaboration with Poland’s legendary Chorea theatre. The work explored fanaticism, cultism, and religious fervor drawn from Euripides’ The Bacchae. 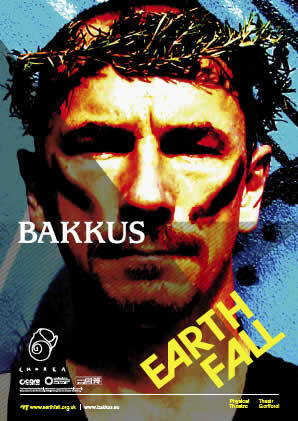 Bakkus was set in a nightclub cellar and showcases Earthfall’s heady blend of film, original music, text and powerful physical movement. Composed by Roger Mills and Paul Wigens, the music fused "New Orleans" style jazz with Chorea’s Elina Toneva’s traditional Bulgarian folk melodies. It also featured extraordinary choral works derived from traditional, and ancient musical sources. The performance delivered an intense and vivid experience through dynamic choreography, film, and music. A collaboration between playwright, performer, and raconteur Gerald Tyler and the acclaimed Bristol based jazz ensemble Limbo. It's a story of Mr. Lewis, a private investigator who is engaged by a mysterious client to track down her one and only love. The absent love transpires to be the last remaining Angel still living on earth. Before long, Mr. Lewis and the Angel become friends, and the client is discovered to be something other than the pining spouse she claims. 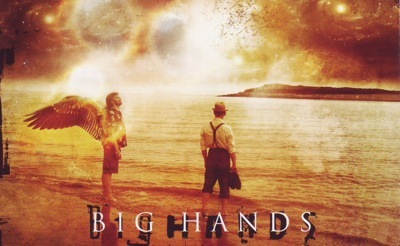 Big Hands was a multimedia theatre-noir performance, combining live music by Limbo and real-time and pre-recorded film. It premiered in Cardiff and toured the UK at the end of September 2007. A dancer, romancer, refugee, soldier, singer, stand-up, stuntman, builder, and bomber collide in an urban vision where blood meets sweat, tears and humour. 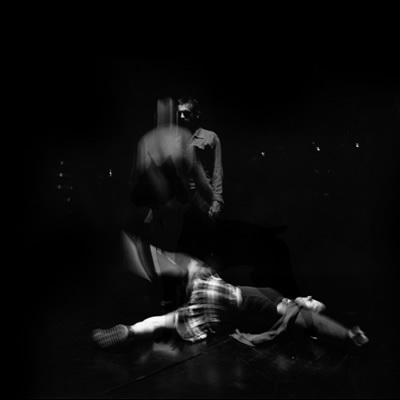 I Can't Stand up for Falling Down is a fast, furious and fervent performance of extreme dance, film, live music, DJ and stand-up as six characters go in search of a new life and end up a family of outcasts in the remains of a house. High energy dance and physical theatre interacting with camera's, projections, film, and music. ROCOCO BLOOD fused superb radical dance with exceptional live music and stunning visual imagery in a dynamic dance theatre work. Memories of first fights and first love are unmasked as extreme dance, and live music underscores the tyrannies within human relationships in a fusion of tenderness, violence, pathos and humour. Into The Deep was a dynamic outdoor work combining physical theatre fused with contemporary circus performance. It was devised by renown UK theatre / circus academy Circomedia with direction from Circus Oz. The work was performed on Bristol's harbourside and featured high-risk stage performances set to a score of live music and sound design by Roger Mills. "Dazzling skill, energy, commitment and vision... a spectacle with attitude and sublime soundtrack". 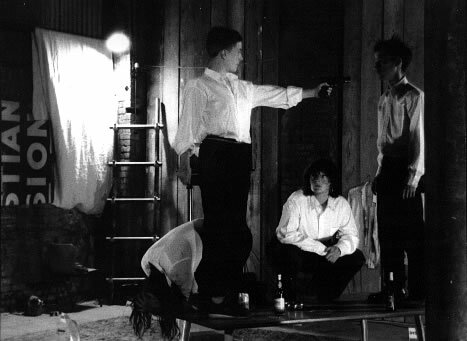 Invisible Bullets was an installation and performance premiered in Hoxton, London in July 1994, as part of 'Fete Worse Than Death'. Commissioned by the late Joshua Compston, the work was performed over two days alongside Leigh Bowery's Minty and The Raincoats and many others. Examining the media's obsession with crime reconstructions; it was a time-based work lasting over ten hours, repeatedly re-enacting murders, each time changing the method of presentation: sometimes performed casually in balaclavas, other times psychotically in underwear. Music and Sound Design by Statik Sound System (Roger Mills, Andy Jenks and Pete Webb, Keith Bailey, Rob Conn). Stampede was a promenade piece examining how crowds react during a riot. At what point are you prepared to declare yourself publicly? What would make you take to the streets? Performed in theatre's and nightclubs, Stampede included excerpts from a secret police manual about riot control, excerpts from Terminator and interviews with the six performers about the loss of control. A system of pressure pads allowed the audience to trigger recordings of different mind control techniques during the performance. A live video projection link provided surveillance of different areas of the space, which at times, was the only way to see the performance.